"Avoid the Famous and Tragic Cakey Face, Don't Crack up!" In the last few years, we women have been even more conscious about our health and skin. ingredients in some makeup products available in the market. Mineral make-up products have been very popular among women. These cosmetics offer flawless coverage for dry skin. These products are considered to be the safest and most effective. Whether you have dry skin or smooth, flawless skin texture, mineral-based products will be a perfect choice. When it comes to choosing mineral based cosmetics, you need to conduct an extensive research to find a reputed company. It is important to buy products from a company which does not use any fillers or harmful ingredients in its products. How are Mineral Cosmetics different? Loose minerals are produced from finely ground natural minerals found beneath the surface of the earth. 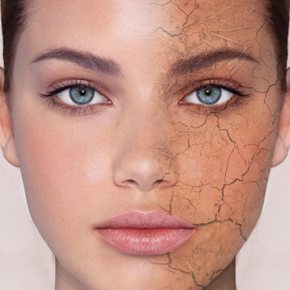 It is important to use high-quality cosmetics containing only minerals, but not any dyes, chemicals or preservatives that may cause breakouts and inflammation. Such products help you remove acne or scars without any side effects on your dry skin. Similarly, mineral based foundations are always safer. While buying a product for dry skin, you should make sure it does not contain any binders, artificial fragrances and synthetic colors. All kinds of chemicals harm your skin in the long run. There are some specific ingredients you need to look for in mineral makeup. Let us give a brief overview of some ingredients you need to focus on. There are many women who use recommended mineral-based products only to find out that they are not suitable for dry skin. Some ingredients in cosmetics can cause breakouts and make your skin itchy and red. On the other hand, some ingredients may be very helpful in removing acne or scars or hide wrinkles and fines lines on your dry skin. Bismuth Oxychloride - One of the most effective ingredients in mineral-based cosmetics is Bismuth Oxychloride. This active ingredient acts as an adherent. Therefore, it helps makeup stay put on your skin. It gives your dry skin the perfect glow which lasts a long time. SPF Protection - It is crucial that a mineral-based cosmetic product has an SPF rating. You should always look for SPF protection. Since UVA and UVB rays can easily penetrate makeup and harm your skin, you need to choose cosmetics which protect your skin against the Sun. A high-quality mineral makeup will always contain SPF. You should always check the product's label and make sure it does not contain Carmine. Although Carmine has been FDA approved, many women have reported allergic reactions and breakouts. Mineral based makeup is perfect for every skin type and tone. It can easily hide wrinkles and fine lines to enhance your appearance and make you look more beautiful. Mineral make-up keeps your skin glowing without any harmful side effects. You just need to make sure that you choose mineral based products from a reputed brand, and purchase from a well established seller. *The opposite is true when it comes to Oily skin types. Stay Tuned for an article about the perfect makeup for Oily skin.